Release day to two amazing books! Happy book birthday to both The Potion Diaries by Amy Alward and Fire Colour One by Jenny Valentine. I've read both books in the past week and here are my short reviews! I was ecstatic to be approved for this book on Netgalley. I've seen so many positive reviews that I was dying to read it. And it definitely didn't disappoint. 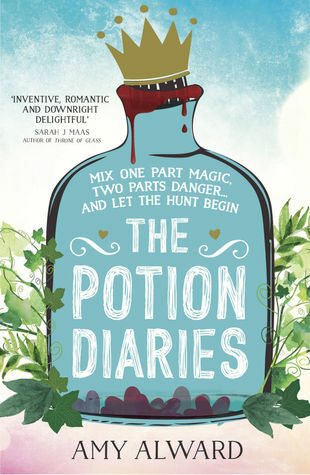 The Potion Diaries is the story of Evelyn and Samantha. Evelyn is a princess who makes a love potion and accidentally falls in love with herself. Samantha is from a family who are trained in mixing positions and she enters The Wilde Hunt - a quest where different teams compete to find the ingredients for the counter potion and save Evelyn. Lots of things (obviously) go wrong and though the book was definitely predictable at many times, it was a very enjoyable read. I loved the idea of the potions and I thought Evelyn was an amazing, independent princess while Samantha is also not scared to go against everyone she loves. These are some strong female characters and I loved reading about them. The world is also great - the potions sound really cool and I loved that the author explored different continents set in the world. The writing has a great flow, so I wasn't bored for a second. As said, it is kinda predictable - definitely towards the end - but if you can get over that and just enjoy the ride, you'll love this book. This books was a completely different read than The Potion Diaries. I didn't really know about this book and only requested it on Netgalley because of the gorgeous cover! And yes, I know you shouldn't buy a book solely based on the cover, but in this instance, it worked out great. Fire Colour One took me a long time to get into. The beginning was confusing - there is too much happening in the first ten pages and then suddenly nothing happening for the next ten. Luckily, I stuck with it. This book gets better with each page and I just wish it was longer. It discussing the death of a parent, kleptomania, missing friends and so many other important themes. I loved seeing kleptomania discussed in a serious and real way and I think that everyone who wants a YA read that is different should pick this book up. Am I being vague about it? Yes, but only because I think you're best going into this book without too much knowledge.